It’s an exquisitely designed backyard hideaway, perfectly planned to encompass everything a busy family of four could want. When Carol and Rob Clement moved with their two teens from a country property in Cumberland to a suburban lot in Orleans, they were happy to renounce all that yardwork for a compact, low-maintenance backyard. What they weren’t ready to give up was a feeling of privacy, of being able to get away from it all when they stepped out the back door. And so, even before the house was built, Rob had mapped out every detail of their 40-by-50-foot back lot. “I actually planned the pool before I planned the house,” he says with a laugh. 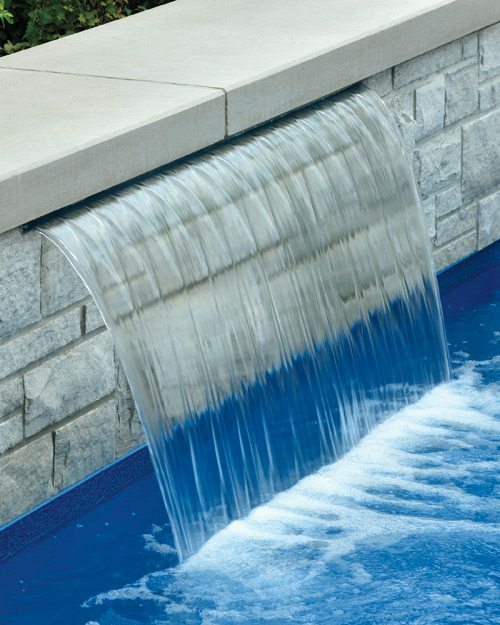 The soft gurgling of the waterfall cancels out neighbourhood noise while serving the dual purpose of being a perfect jumping rock for the Clement kids and their friends. 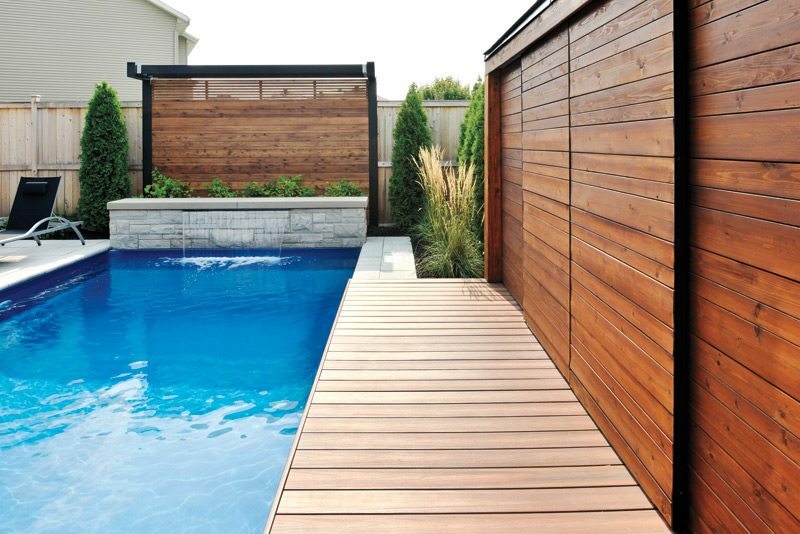 Added privacy is provided courtesy of three complementary design features — a stained cedar shed conceals the mechanics for the pool and acts as a privacy wall and a sound buffer. 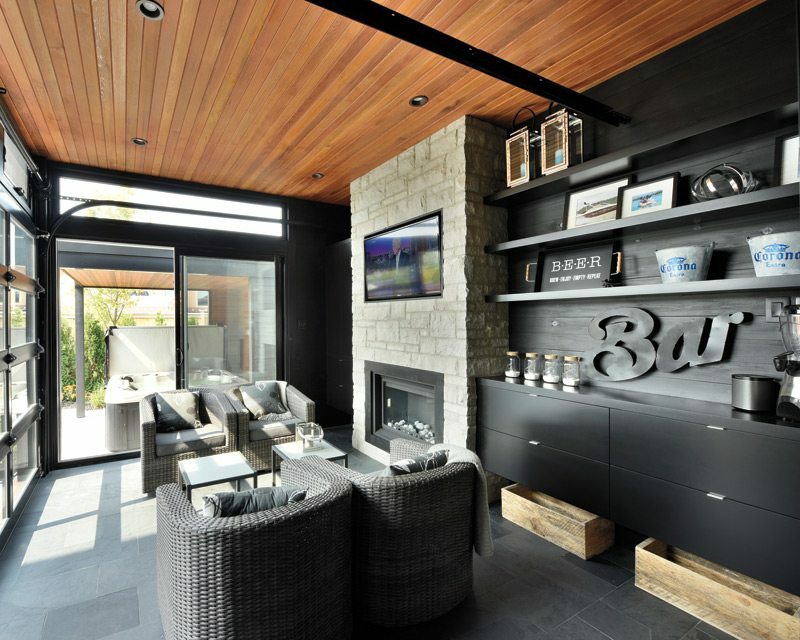 The matching cedar walls behind the waterfall and hot tub also foster a sense of solitude. Surprisingly, the most brilliant feature of this retreat is neither the pool nor the hot tub. “It’s the OLS that makes it,” says Carol, referring to the “outdoor living space,” a four-season room that extends from the corner of the house. 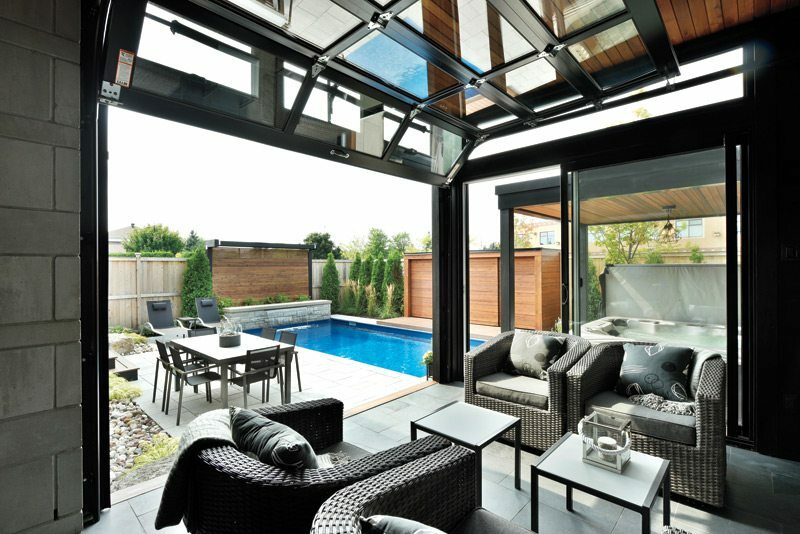 It is used as an open-air poolside shelter and bar hub in summer and a cozy sunroom in winter. Here, the Clements kick back and relax with friends, the drinks and snacks close at hand. “It’s great to have everyone congregate here rather than in the kitchen,” says Carol. On cool evenings, the heated slate floors and fireplace keep things cozy. There’s even a TV, which swings out from the wall so they can watch a movie or a baseball game from the comfort of the hot tub. The Clements laugh when asked whether they have to draw up a schedule with their teens so that the parents have a turn in this backyard oasis. “It’s definitely a teen paradise,” says Carol. “It has shown up in a lot of Instagram photos.” But she says it’s nice to have a home base that appeals to the whole family. “There’s enough space for everybody, and it keeps the kids around.” You certainly can’t beat the location.